IFFI Screening Committee Chairmani Mike Pandey speaking at Open Forum.Filmmakers P Sheshadri and Basant Kumar Pati also seen. Regional filmmakers showcasing their films at IFFI today said that non-Hindi cinema did not recieve proper slots at film festivals as a whole, resulting in poor response by the audience. "Festival authorities should give prime slots for regional films. My film for Kolkata Film Festival had hardly 30 people watching it. 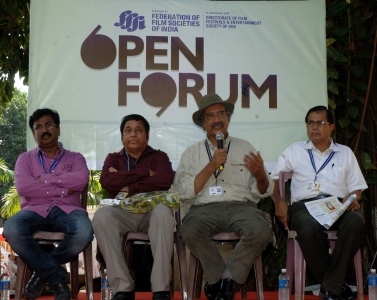 In IFFI, atleast it's little better and I had 100 people watching it," Kannada filmmaker P Seshadri said at the Open Forum Future of Regional Cinema at IFFI here. Seshadri's film 'Bettada Jeeva' is a part of prestigious Indian Panorama section. The movie is based on Jnanpith awardee K Shivaram Karanth's novel. The film had won award for Best Film on Environment at 58th National Awards Seshadri, one of the most revered names in regional cinema, said if we get good slot (in film festivals) we can get good audience. The director said festival like Cannes are encouraging only Bollywood cinema. "My six films were rejected in the festival," he said. U Radhakrishnan, moderator of the forum and an advisor to Jagram Film Festival (JFF), said the plight of regional cinema is that people don't even know their names. "Audience watch mainstream films repeatedly even though they agree that the films are bad," he said. Mike Pandey, internationally famed documentary maker and Chairman of Indian documentary producers association, said every state needs to promote its regional cinema which reflects the passage of time and transition happening in the state. Asserting that multiplexes are an impediment for regional cinema, Pandey said the audience cannot afford to pay Rs 200-300 for a ticket. "They can pay Rs 30-50 for the ticket," he said. Pandey said regional cinema is thought provoking and it should be promoted as it reflects the country as a whole.